Videoconferencing Out on a Lim | Experiences, curriculum thoughts, and technology rants related to educational videoconferencing. 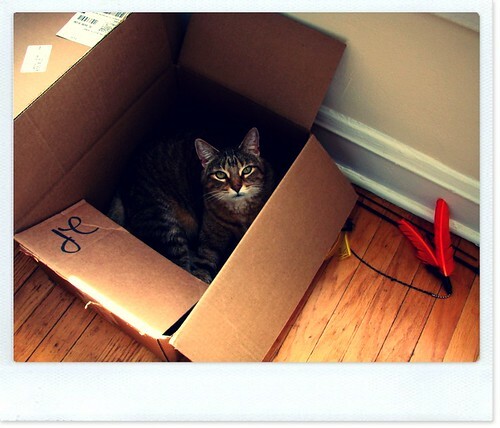 Unpacking at my new blog! Image by Katie Tegtmeyer. Greetings, my VC Out on a Lim followers! I have finally started blogging again over at http://blog.janinelim.com. To the 95 of you subscribed to this blog via email, go here to subscribe to my new blog via email. For those of you using an RSS reader, here’s the new RSS feed. Today is my last day at Berrien RESA as an Instructional Technology Consultant. I have accepted a position as Associate Dean for Higher Education in the School of Distance Education at Andrews University (also here in Berrien Springs, MI) starting tomorrow! I will be moving my blog over to http://blog.janinelim.com so that I can blog about a broader set of distance technologies: including videoconferencing, online learning, blended learning, and webinars / webconferencing. Soon, I’ll tell you more about my new job on that blog. There’s nothing there yet! Still have a bit of set up to do. I’ll let you know here when it’s ready for subscriptions. But today, I’d like to thank all of you, my readers, for your great comments, input, and feedback over the 6+ years that I’ve blogged about videoconferencing. It’s been such a great learning journey and a great continuous conversation! I hope that you will continue the conversation with me on my new blog! What will happen to VC Out on a Lim? This blog is hosted on WordPress.com, and so will be here “forever” as vcoutonalim.wordpress.com for sure, and for another year or two as vcoutonalim.org. I am also hoping to make an index to this blog sometime in the next month or two so it’s easier for you to find the information that is buried here. So watch for another post with that! I’ll be staying on the TWICE board for another year at least. Sustainability plans are in place! Sue Porter will continue to coordinate Read Around the Planet and be the front line support for CAPspace. Polycom‘s support of these two projects is still in place of course! Scott Sherrill, our programmer for CAPspace will continue to improve the site. There are still many improvements we want to make to CAPspace! Max Graves will take over the coordination of the TWICE Verification Partners. The TWICE ASK committee has taken over the management of all the ASK programs, and billing will come from TWICE instead of Berrien RESA. The MysteryQuest and HistoryQuest sessions I’ve been running have been bequeathed by Berrien RESA to Whirlidurb, an excellent curriculum videoconferencing services provider. Roxanne Glaser, Content Director, is the best multipoint facilitator I’ve ever known, and she has assisted with materials development and facilitation slides for my Quests since 2007. In addition, Whirlidurb has the bridging capabilities (thanks to super bridge dude Shane Howard) to continue this project with a high level of quality for your experience. The other videoconferencing activities of Berrien RESA, including VCcontentproviders.org and the Teachers’ Favorite Awards will be taken over by my replacement. Check our website in early September to get new contact information. Thank you again for being part of my learning community and sharing feedback, ideas, resources, and suggestions! 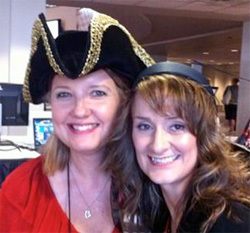 Yesterday was the 2nd annual Video conference Playground at the ISTE 2011 Conference. For those of you who missed this amazing event, here are a few resources you should review! Check out the list of Content Providers we featured this year. Video conference technologies (carts, group systems, and desktop software) featured in the playground. Captain Roxanne Glaser led an amazing team of pirate deck hands and volunteers! Hope YOU participate next year! Check Flickr next week for more pictures from the playground. I had over 100 participants in my ISTE Bring Your Own Laptop (BYOL) session on CAPspace today (Collaborations Around the Planet). Great attendance, but wow, what a lot of people! I knew I couldn’t handle it myself, with all the account creation and questions. So, I recruited several of the SIG IVC pirates to assist me. You should know them and friend them on CAPspace!! Pirate guide in the Videoconference Playground tomorrow! One of the few who qualifies for an event coordinator level account in CAPspace, for running her The Mitten project and Potato Man Match project. 5 years of participation in Read Around the Planet! We also had Stephanie, from Polycom‘s Grants Team (booth #209) assisting in the session. They were all decked out in aweomse pirate gear! Audra has the pictures, and they should be posted in the SIG IVC Flickr site in the next day or two. In addition, Roxanne Glaser, Whirlidurb‘s Content Director, and Pirate Captain helped me chunk the workshop to best take advantage of the pirate assistance. Thank you pirates for making such a smooth BYOL session! Hope you all can visit the Videoconference Playground at ISTE tomorrow! Please complete this ISTE evaluation form.